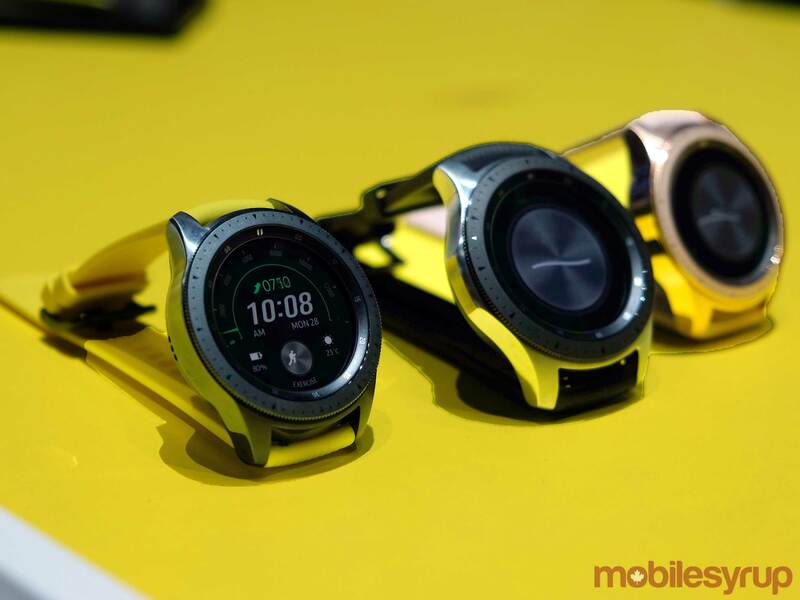 Samsung may have surprised few with the Galaxy Note 9’s launch at Unpacked 2018, given all the leaks surrounding the device, but the Galaxy Watch wasn’t as easy to predict. That the company is pursuing wearables isn’t surprising. 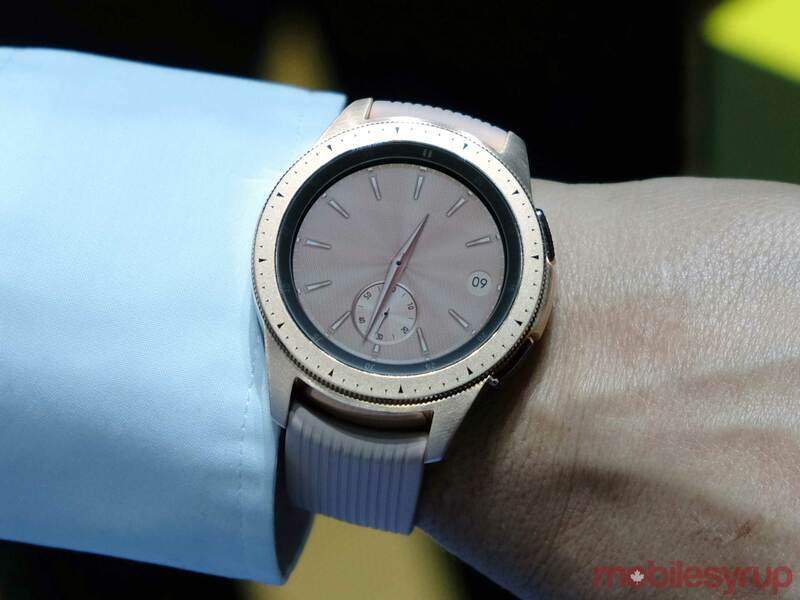 I’ve lost count on how many Samsung has launched since the very first Galaxy Gear smartwatch back in 2013. Since then, the tech giant has abandoned Android in favour of Tizen, flirted with LTE connectivity and experimented with a variety of form factors and designs. Is the Galaxy Watch a game-changer in that regard? Probably not, but the fact it looks nicer is a good start. Trimming the fat on an ambitious smartwatch is challenging enough. You have two sizes at 42mm and 46mm, with three colour schemes to choose from. 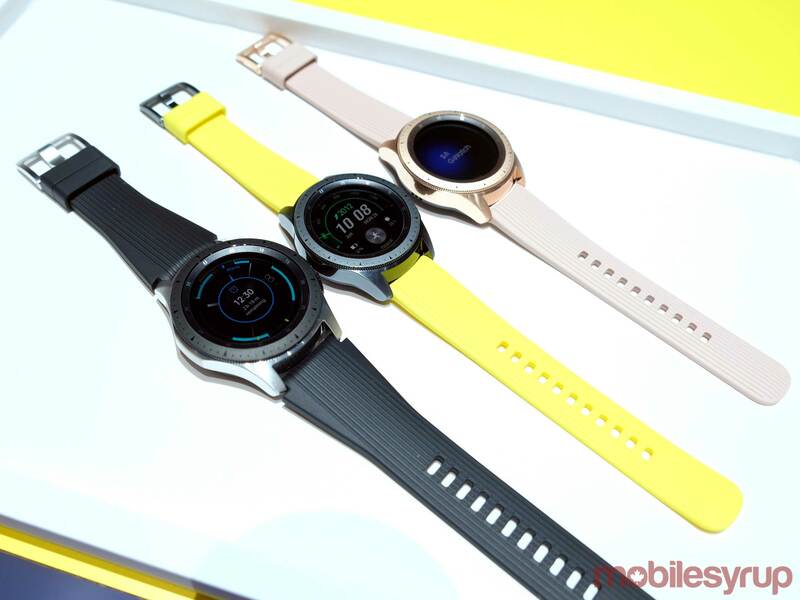 The two darker ones look like slimmer versions of the Gear S3 Classic or Frontier, whereas the rose gold one offers a more distinct look. Shedding weight required getting rid of some of the features inherent in those devices. The body doesn’t have as much metal as before. The LTE-enabled model will carry some extra weight, but Samsung says taking out the Magnetic Secure Transmission (MST) emitter drops it even further. MST simulates swiping a magnetic strip card, which was more popular at point-of-sale in the U.S., but not in Canada. It’s not really a loss since NFC works just fine. The straps felt nice, and with standard lugs, swapping out for another strap that fits is easy. It was the lightweight feel of the watch that was obvious to me, though I can’t be certain that the software experience is dramatically different. One thing that is very different is the size of the battery relative to the watch size. 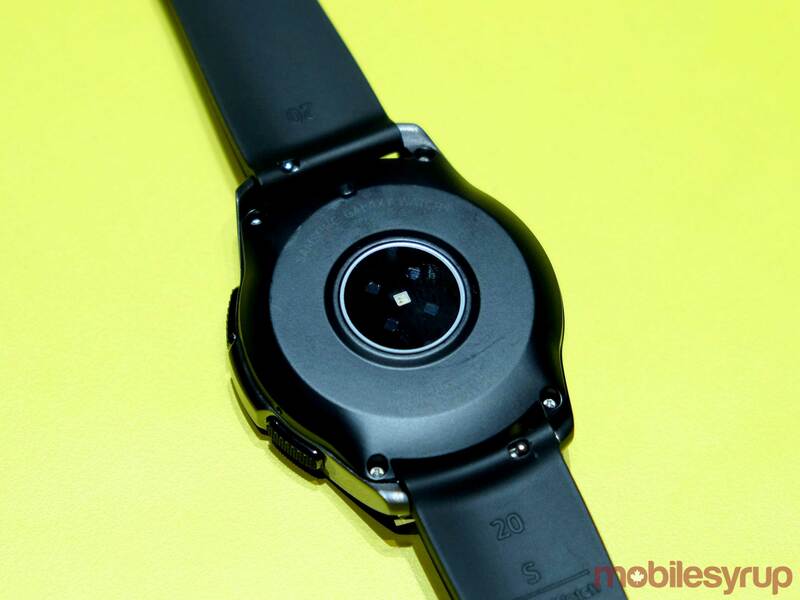 The 42mm model has a 270mAh battery, whereas the 46mm packs in a significantly larger 472mAh battery. Samsung claims the latter model can get as many as six days of use before charging. Beyond the size of the watch itself, it’s choosing between the Bluetooth and LTE models that may figure more prominently. But then, there’s the whole caveat of which carriers will support the watch’s LTE connectivity (I’ll get to that). Samsung will have to distinguish the differences between the two versions to differentiate them. It’s not all about the connectivity. For example, the LTE model will have 1.5GB of RAM — that’s double the Bluetooth model. So far, it doesn’t appear that battery size will be different, but since the LTE model comes out later than its sibling, we won’t know for sure. LTE connectivity via an eSIM is very cool to have, assuming you get something to work with from your carrier. Nothing was confirmed at the event as far as Canada’s carriers are concerned, but it may be that not all of the Big 3 will play ball with Samsung on this one. For those with other brands, like Fido, Virgin, Videotron and Freedom, the likelihood of compatibility stretching that far seems increasingly thin. If the Apple Watch can’t get everyone to jump on board, then Samsung may have a tough time getting better results. 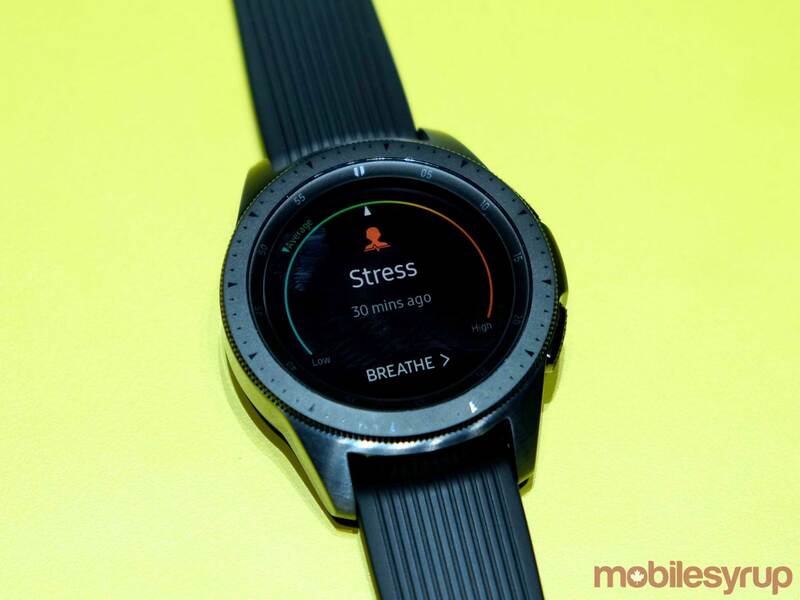 I’ve never been overly impressed at Samsung’s efforts to offer a viable health and fitness suite of features, but it looks like the company is going to give it a go with the Galaxy Watch. One of the key additions is a stress management app that measures heart rate spikes and provide breathing exercises to chill out. That’s not new, as Fitbit has done that on various devices in the past. Nevertheless, it will be interesting to see if it has any real value in real-world use cases. Then there’s the exercise routine, where it can track up to 39 different exercises. Six of them are trackable automatically without manual input. It’s too early to gauge whether step accuracy, heart rate or the other tracking algorithms are truly effective. We’ll know better once we can put it through proper testing. Any rumour of Samsung switching to Wear OS for its next smartwatch proved to be unfounded. It’s still all about Tizen, and while that gives Samsung a greater level of control over how they manage the OS, it creates an ebb and flow that can be satisfying and maddening all at once. Tizen has always run pretty smoothly on the company’s smartwatches, and the rotating bezel has been a major boon to navigation. But Samsung didn’t say much about how app support might improve with this launch. Will there be more third-party apps developed for it? No one confirmed. Not only that, but Google Pay remains on the sidelines in favour of Samsung Pay. It may not be an issue if you’ve already made good use of its existing integration with Canadian banks and card issuers. If that is a problem for you, just bear it in mind. 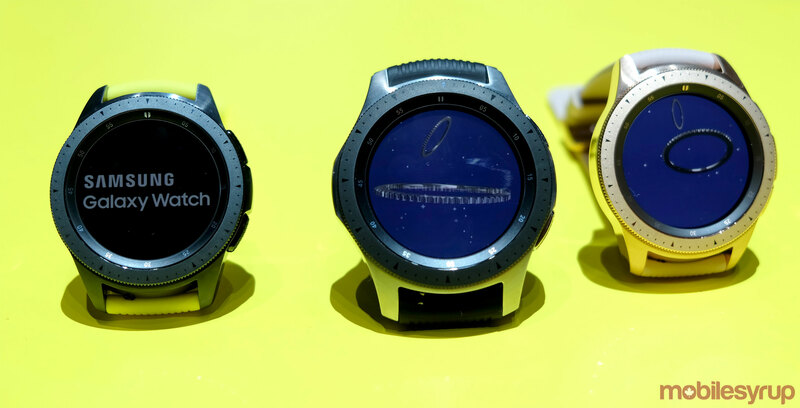 All Samsung really did at its most recent Unpacked event was tease the Galaxy Watch. We know it will be compatible with Android phones running version 5.0 and later, as well as iOS devices running iOS 9 or later. We also know the sizing and designs that will be available. It’s just the performance, functionality and integration that remains somewhat mysterious. No availability or pricing information was revealed during the event, though Samsung Canada has confirmed that the LTE model will come later in the year after the Bluetooth version comes out first.